Ah, Bethesda. I wish I loved you more. You are geographically desirable. You are attractive. You are fairly well built. But try as I do, I just can’t seem to fall in love. My latest attempt is at Grapeseed American Bistro. It’s one of Washingtonian’s 100 Best Restaurants, so hopes are high. Everything seems right at first. A warm greeting at the door. A cool vibe inside. We’re hitting it off well enough at the start. I like that I can order a taste of wine and then move on to something different to accompany my meal. I don’t think that qualifies as being fickle, it’s encouraged here. The bread is fine- nothing special- but the accompanying dip with tomatoes, oil, and garlic is quite nice. 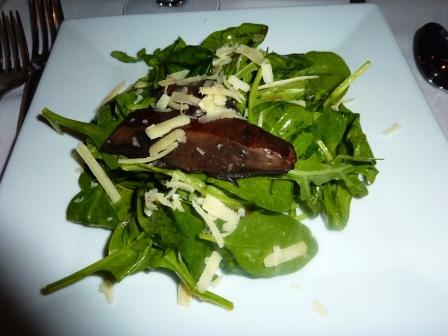 My husband and I share a first course of grilled portobello mushroom salad with arugula, Idiazabal cheese, caramelized onion and port vinaigrette. It needs pepper, and higher quality olive oil and vinegar would help its personality. As is, its a snooze. Points however for the fact that the portions are served already split in two and when I remark that they are nicely sized, the server tells us that they’ve been enhanced so we wouldn’t be handed a paltry portion. Classy. 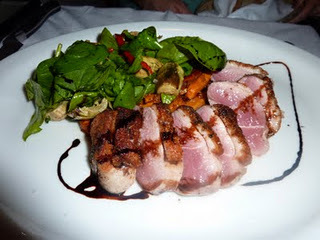 My entree is pan roasted duck breast, with baby artichoke salad, and sweet potatoes. It’s a pretty plate but the flavor is just okay. Good looks aren’t everything. The duck is a bit undercooked and rubbery. The accompanying salad is too similar to the one I had for my first course. I wish the server had pointed this out. I’m looking down at my plate and wishing I was somewhere else. My husband’s pan seared Hirame fish with Israeli couscous, asparagus, and almond-honey vinaigrette is cooked just perfectly but it’s fairly dull. It begs for some extra sauce. Here’s another pretty dish that lacks that extra oomph. We’re not quite ready to call it a night. We’re willing to give Grapeseed one more chance. We order a sorbet trio of pear, plum and red current sorbets. The flavors and textures are good. Is it enough to make our hearts go pitter patter? No. On the plus side, we have a Living Social coupon for $60, so while it’s not a cheap date, it’s not an over the top dinner. Of course, we would have been less content without the discount. The meal at Grapeseed wasn’t bad. It just didn’t knock our socks off and wasn’t memorable enough to warrant another visit anytime soon. However, there’s a younger and more casual sibling next door – Freddy’s Lobsters and Clams. I’ll have to leave my Kosher husband home for this one, but maybe I can make a love connection in Bethesda with a lobster roll. Stay tuned. Lori – were you there on Saturday night? My husband and I were there then using a living social coupon as well! Our biggest complaint was that they were out of THREE things we wanted to order, which on a Saturday night, even at 9:30 is a little ridiculous (gnocchi, asparagus soup, and brownie.). 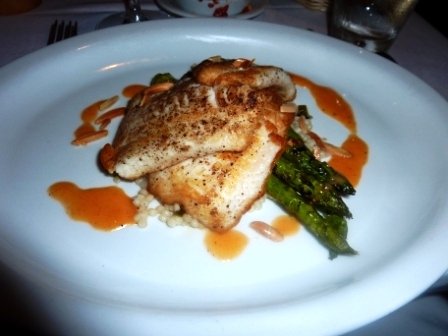 I had the fish like your husband (although mine was rockfish, so maybe it wasn't the same night), which I wasn't too impressed with. Sam had the duck, which he liked. But we really liked our appetizers – the mushrooms with truffle polenta, and the Italian burrata with peas and walnuts. We were overall more impressed with the wine we had than the food – we really enjoyed the way they paired the wine with the dishes. I would love to go back for a happy hour on Friday when they have $5 wine and $5 appetizers. We were there a week ago. I liked the wine pairings as well. Happy hour is a worth a try!